A set piece occurs when a ball is returned to open play following a stoppage. In rugby, this traditionally only includes scrums and lineouts, however a case could be made that the restart from halfway is its own form of set piece as it also returns to ball to play from a stoppage. Certainly, restarts in competitive rugby involve a similar amount of specialised training as scrums and lineouts, and there is a large amount of strategy involved. The team kicking off has options regarding where they want to aim their kick. Their goal is either to regain possession directly from the kick-off with a short kick, or to pin the opposing team deep in their own territory with a deep kick so that they regain possession from an under-pressure clearance kick. The receiving team often puts lineout specialists (second rowers and lifters) in pods near the 10-metre mark to gain a height advantage in contested kicks, and when deeper kicks occur a series of set plays usually follow wherein the forwards attempt to settle the ball somewhere that provides the clearing kicker a good angle towards the sideline. 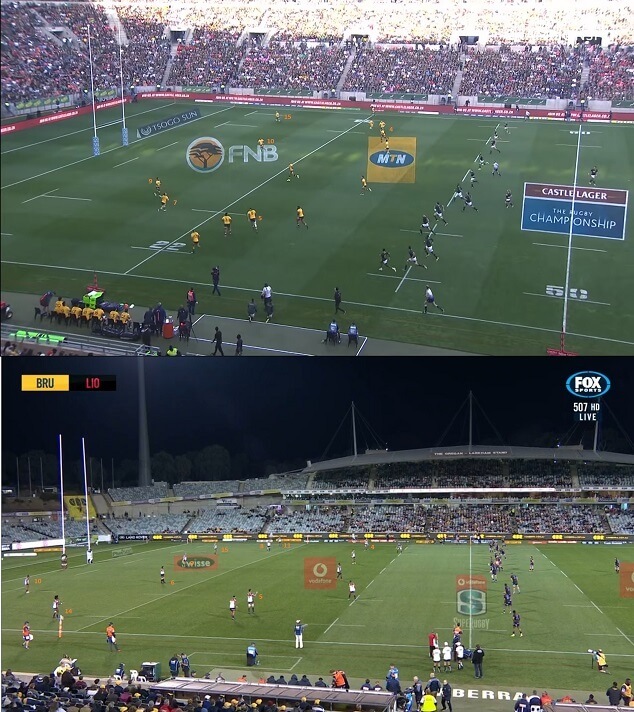 Different teams vary regarding how this clearing kick takes place, with most Northern Hemisphere teams relying on their scrumhalf to clear with a box kick and Australian teams in particular preferring to toss the ball back to a designated kicker (usually the flyhalf or fullback). The Australian method is mathematically inferior for two reasons. The first is that there is a chance that the pass from the base of the ruck to the kicker by the scrumhalf will be poor and this can have devastating consequences. The second is that in order to prevent a charge down, the kicker must stand at least 10 metres behind the advantage line, effectively shaving that distance off of the kick and making it harder to effectively clear the ball from your own territory. An interesting thing made apparent in this image is that Beale is standing almost in the centre of the field, meaning that he never intended to put the ball into touch. There are other kicking options closer to the sidelines, but Genia passes to Beale. My guess is that the Wallabies had identified the Springbok’s defensive frailties in the 15-metre channels before the game, and that Beale was betting on his captain to utilise a 14kg advantage to run right over Dyantyi (who has only a 68% tackle success rate this year). Counter-attacking from a deep restart is a very risky move and very few teams outside of New Zealand (who specialise in counter-attacking plays) can pull it off with any sort of regularity. 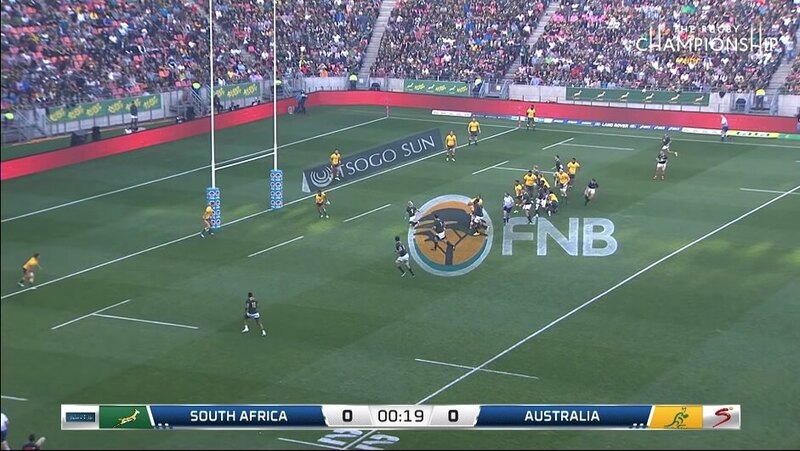 What may have been forgotten in the aftermath of this try is that after the initial catch and carry by Michael Hooper, the second phase was set up by Folau Faingaa who comes within a few inches of giving the Springboks an attacking scrum 10 metres out (below). This phase showcases the inherent danger in delaying the exit play as there is always a chance for things to go wrong on a rugby field, especially when defensive pressure is applied. If we wind the clock back a few seconds further, we can see the Wallabies in their pre-determined kick-off receipt positions (below). As is common, the tallest players on the field (numbers 4 and 5) stand beside prop lifters to enable them to get above chasers in the event of a short kick. 3 of the 4 players in the 22-metre zone are backs with the ability to return the kick-off without the need for an intervening ruck. Hooper is also back here and I would criticise this option as he is not a kicker. Reece Hodge would have been a better choice as he has a fantastic boot. Astute readers may have noticed that I have juxtaposed this kick-off with the first kick-off from Saturday’s Brumbies v Lions game in Canberra. 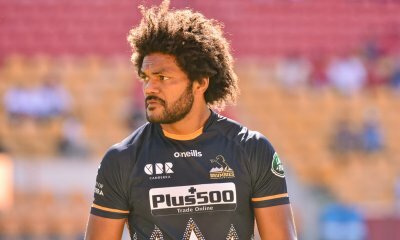 The 22-metre zone similarly includes numbers 9, 10, 15, and one loose forward, but the Brumbies have additionally stacked it with both wingers and an additional loose forward. Michael Cheika has put his wingers closer to the 10-metre line (Marika Koroibete and Israel Folau are two of the furthest forward players and take no part whatsoever in the ensuing sequence of play) which would typically be an odd choice given that the back 3 are experienced at receiving (and usually returning) kicks in general play without the assistance of lifters. When it comes to the Wallabies however, neither winger has a notable kicking ability and Folau’s solo jumping talents would be wasted by positioning him in an incontestable part of the field. 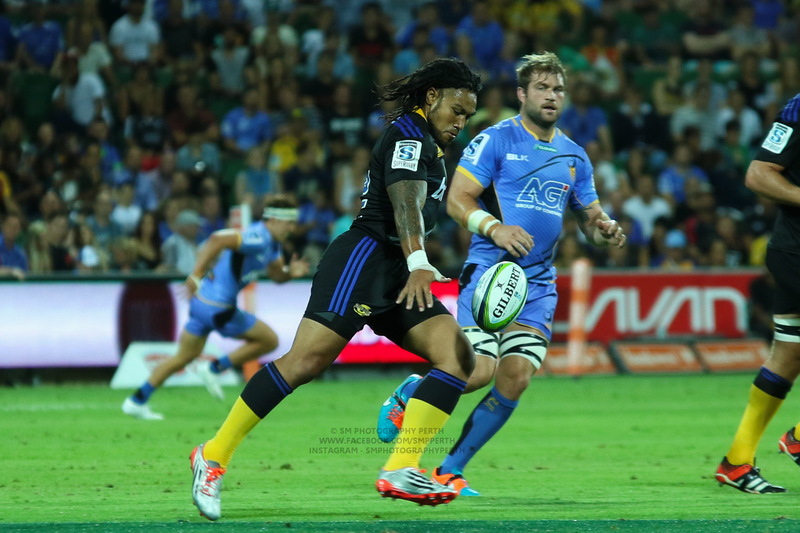 This kick-off is lost by Lachlan McCaffrey (above) and the Brumbies are lucky to regain possession 5 metres from their own try line, leading to Christian Lealiifano making the clearing kick almost on his own dead ball line and handing possession to the Lions at about the same latitude as where McCaffrey originally caught it. 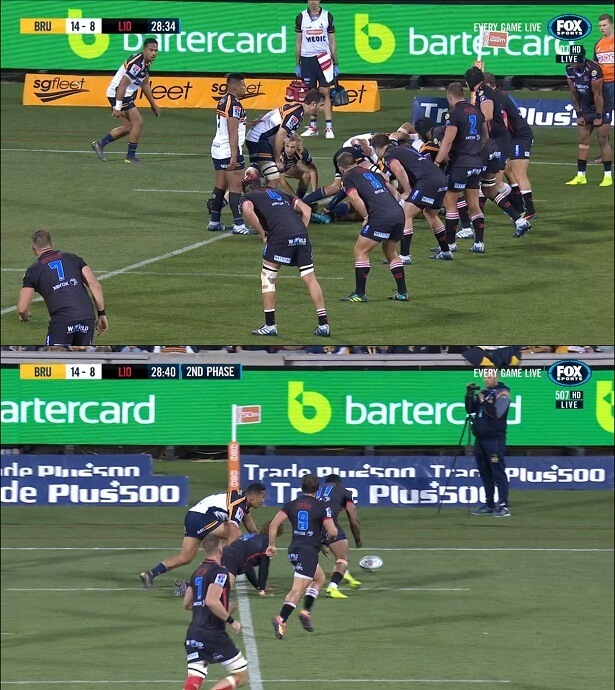 While any kick receipt plan has an element of risk when it comes to the receiver actually holding onto the ball, by failing to use Joe Powell here (and by failing to shift the ball away from the centre of the field) the Brumbies have handed the ball to the Lions for a tiny territorial gain. Not only this, but they have added an element of risk by forcing Powell to have to pass dangerously close to the pads. Only one kick-off per game is made by a team without points having been scored against them. All other restarts are a result of successful penalty kicks or tries by the receiving team. As there is a large emphasis on momentum and “hitting back” in rugby, this usually means that the kicking team is emotionally charged and will attempt to put big hits on the receiver and challenge at the ensuing ruck. 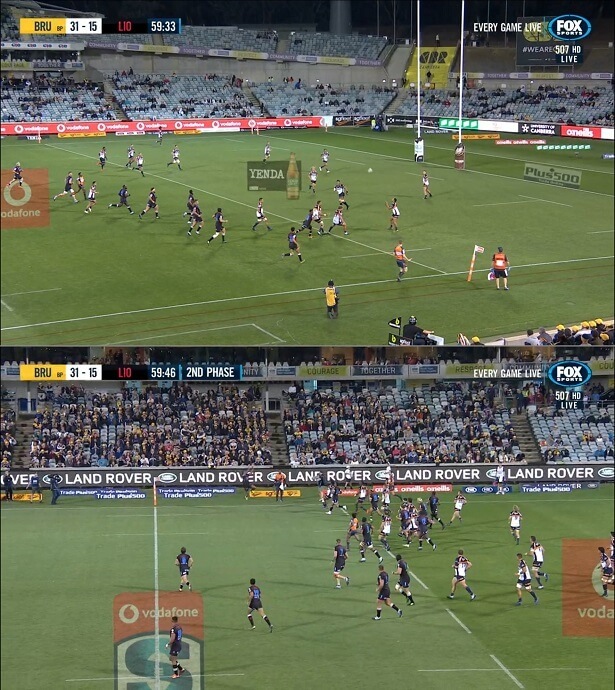 The Brumbies score in the 21st minute and they deploy the same set-up. McCaffrey receives the ball again, and this time holds onto it just over the 22-metre line (below). Unfortunately, for some reason the Brumbies attempt a similar play to the Wallabies and shovel the ball along the line until someone drops it (in this case, Tom Wright). This gifts the Lions an attacking scrum 10 metres out which is quickly converted into 3 points by their potent front row. 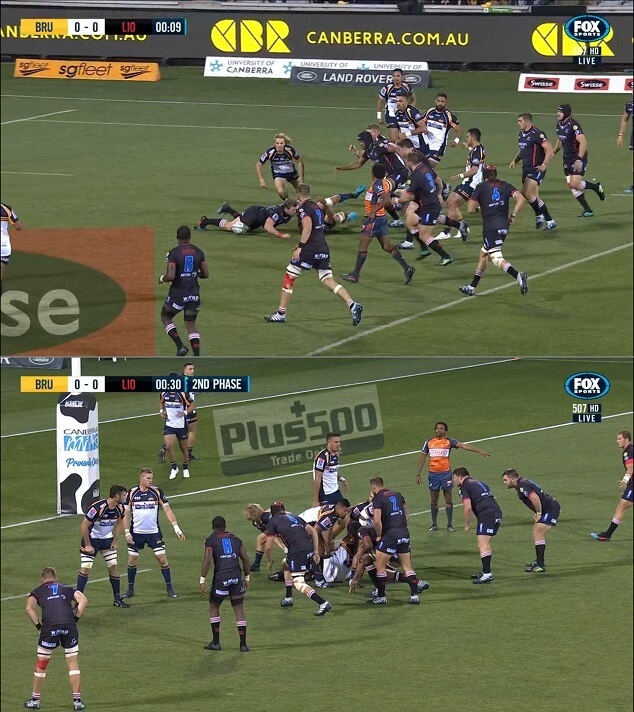 The Brumbies score again in the 26th minute and a third identical kick-off takes place. McCaffrey again creates a ruck on the 22-metre line, but Powell wisely decides to make the exit kick himself (below). He manages to get almost 30 metres on his kick and keep it very close to the touch line. The ball stays in play, and the work of speedster Toni Pulu puts a lot of pressure on the Lions receivers. 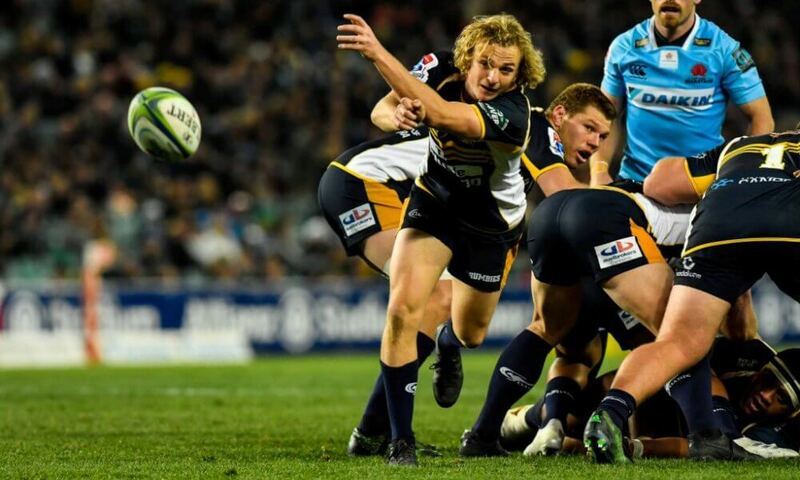 The Brumbies are unlucky not to win the ball back immediately due to stepping into touch or knocking-on, however they do manage to win a breakdown penalty a few seconds later. The difference here is astonishing. 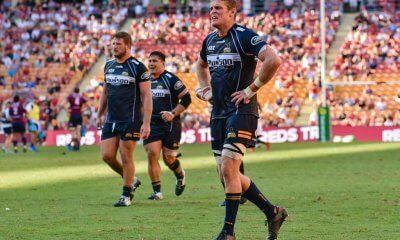 As Drew Mitchell says in the commentary, the Brumbies “made an adjustment, Joe Powell put up a contestable [kick] and the Lions are under pressure on the halfway [line]… That’s what they need to do: just keep it simple, get out of their own half, put the pressure back on the Lions, force the turnover.” This is an example of good adaptive rugby from the Brumbies, who have consistently been one of the smarter Super Rugby clubs in Australia despite lacking the dazzling star-studded backlines of their competitors. Conversely, if the kick had not been chased then one of the big South African lads would have run the ball straight back into the Brumbies’ half. The lesson here is that clearing kicks either need to go out or be chased. The possibility of a quick throw-in adds that clearing kicks ideally need to go well out, or be chased despite finding touch. Of course, Powell was outside of his 22-metre zone so putting the kick into touch was not an option for him in this case. The Brumbies next receive a kick-off in the 55th minute after a try to Tom Banks. The kick lands in the same spot but the Brumbies have substituted McCaffrey so it is received by Wright about 15 metres out from his try line. Simply by running well, Wright makes a good 10 metres and this causes him to be brought down high by a Lions team too desperate to cause a turnover leading to a penalty. An identical catch and run by Wright occurs again (below) after the Brumbies score at the other end of the park only 3 minutes later so we can see what could have eventuated in the absence of a penalty. The front-foot ball allows Lealiifano to put up a contestable kick and the Brumbies are back on the attack near the halfway line again. This game is a perfect microcosm of the art of the kick-off receipt. All Australian sides (including the Wallabies) struggle with this facet of the game. Some portion of that is undoubtedly mental, and there is only so much that can be done to offset it. However, by simply selecting kicking halfbacks and speedy wingers who can chase, the ability of a team to exit from their own half becomes astronomically higher. Ideally, a second chaser (usually a centre) would pair up with the winger because modern back 3 players are skilled at spinning to avoid speeding tacklers the moment they hit the ground from a catch. 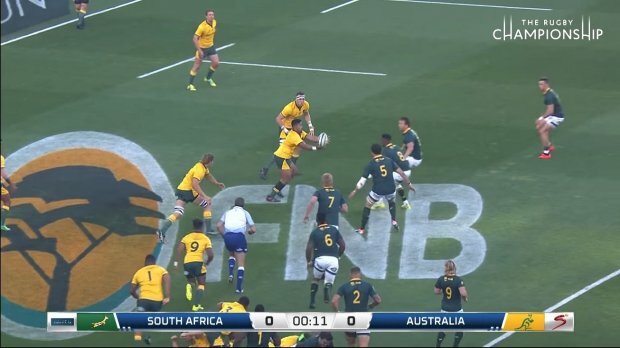 Professional rugby in Australia needs to realise that the kick-off receipt is essentially a third set piece and give it the respect it deserves. This needs to go beyond the casual recognition that you need to catch the ball and then kick it. Just as you would never pick a second rower who can’t jump or a prop who can’t hold up a scrum, the scrumhalf, wingers, and potentially even centres need to be assessed on their box kicking and chasing abilities respectively. Thanks for the article. And you are entirely correct it is the 4th set piece. Scrum, lineout, kick-off, and? The only other ways I can think of that play is restarted are from 22 drop outs and quick taps. But why would we get Scrummies to kick? Isn’t whinging about scrummies kicking a key component of the Australian style? Especially given that these kicks are effectively box kicks? 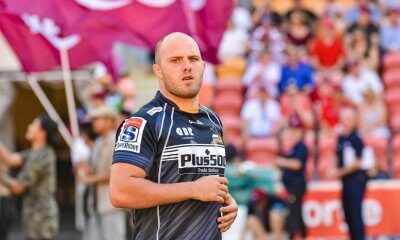 All we hear is that Genia can’t box kick, Phipps can’t box kick, Powell shouldn’t box kick… Gordon’s great because he runs, the Qld lads aren’t well known yet……. This is precisely the problem. The best box kicking Australian scrumhalf is currently Nic White as far as I can tell. Hopefully the next Wallabies coach realises the importance of this part of the game and selects around it – though obviously a scrumhalf’s passing game has to come first. As for running, well that’s certainly ideal but if you can’t pass or box kick then may as well play a team of wingers! You’re right, White’s got the best kick. Problem is, half the determining factor in the quality of a box kick is the chase. And we don’t, for the most part, have any attention to detail in chasing kicks. We also don’t tend to set up well for box kicks. They’re constantly telegraphed. Half the skill in box kicking is avoiding the telegraph, having wingers ready to chase and not waiting for a posse of forwards to arrive as illegal blockers. While not telegraphing the kick is ideal, in reality this is rarely the case when facing top-tier players in an exit situation. I do think that we haven’t had much genuine speed in our wingers for a while though, and that hurts our chase. The forward blocking thing works both ways: the kicking team protects the kicker and the receiving team protects the receiver. The only real solution is to put the ball high enough that there’s time for the chasers to arrive. I do get that it’s hard not to telegraph the kick, but we saw the Irish scrumhalves kicking without blockers and often without telegraphing it last year. And they do it more regularly than we do. If they can do it, then it’s certainly possible for us to learn to do it. If you watch at a level under the international game in the NH, all the 9’s box kick (that might be a slight exaggeration, but the vast majority of them do) and as a spectator, and players on the field can usually see it coming. You put two forwards in to block to charge down – not illegally, you just make the ruck a little wider and/or longer so the 9 has time, and you put chasers on the kick. Actually, Wales have done it with North as one of the blockers, then had the scrum half run forward to put him onside and chase, and he hares off to chase the kick too, because he can block from basically a sprinter’s starting position. With a good kick, he can still get there as ball is coming down, and he’s big enough to block on the side of the ruck. Not necessarily ideal, but it is workable. If 80 scrum halves in the NH (14 teams in France, 14 in the Celtic & Italian countries, 12 in England, x2 for the substitutes) can all do it, and the teams can work out how to chase ok, surely 8 of them in Australia can learn it? The key phrase from my post is “in an exit situation”. Box kicking in general play is slightly different. Sorry – I see get/give Kick-off as a completely separate facet of play from get/give Drop-Outs. I haven’t really given much thought to playing Free-Kicks as a set-piece. I suppose 22 drop outs are sort of a set piece, and they are very different because the receivers are on the attack rather than trying to exit. Maybe an idea for a future article! Absolutely. And the options for the kicking team are so much broader given no 10m gap. You can really do the ‘fist’ kickoff and smash over if you get yourselves organised. I see it as almost guaranteed ‘own ball’ if you’re organised. What delight to read something about rugby. Great article. Could have dropped a mention though for the best kick of the game from Faingaa! Maybe a problem for Aus sides is that mostly they don’t get as many opportunities to put into practise because they don’t get to add to the scoreline as frequently as others? Actually the 4 Australian Super Rugby sides score an average of just over 25 points per game, with NZ on 26 points per game and the South African conference actually below the Australian sides with just under 25 points per game.